Get the best legal terms and conditions to set you up to succeed with your new business! What should I have in a Business Purchase Agreement to get me the best deal? You can also use a business purchase as a good time to choose which employees you want to take on. Buying a business? Click for assistance! Buying a business is an exciting and nerve wracking time. You will be working for yourself which is exciting, but at the same time, all the responsibility for the business’ success falls on you, a nerve wracking time. You will more than likely have to invest a lot of money to purchase a business and you may need to borrow money against an important personal asset such as your house to realise your dream. If you’re heading down the path of becoming a business owner, then chances are you are serious about making sure thing are done the right way. A lot is at stake! This means that it is really important to get your business purchase agreement right. Business sellers generally have their lawyer draw up a business purchase agreement. Remember that their lawyer is not working for you; they are trying to get the best deal for their client. When you’re investing so much money and taking on a big risk, it pays to have someone in your corner. It might sound hollow coming from lawyers but it is a good idea to have your own lawyer check over the business purchase agreement before you sign the dotted line. The parties – who is the seller and who is the purchaser? Description of business – a clear description of the business that is being purchased. The purchase price – broken down into components such as the value of contracts/ client base, equipment, stock, intellectual property. Payment terms – when is the purchase price payable and is it paid instalments or in full on completion? Subject to finance – whether the purchase is subject to third party finance (a loan). What intellectual property is included in the sale – such as copyright, trademarks, patents etc. The client contracts that are included in the sale. Is the purchaser buying the businesses or the assets, or the actual company that runs the business (if the business is a company)? The seller’s involvement in the business after the purchase – will the seller stick around and train you as the purchaser or work for the business for a set period of time post sale? A restraint of trade clause including a non-compete and non-solicitation clause – as a purchaser you will want to make sure that the seller doesn’t commence a competing business nearby, taking all their old clients – which could negatively impact your newly purchased business. As the purchaser you will want to include some warranty clauses and contingencies in the agreement. What happens if the seller has provided false or inaccurate information, particularly financial information about the business? What happens if the business is not as successful as the seller made out? What happens if the business has a liability (such as someone is suing them) and this was not disclosed to the purchaser prior to sale? What happens if the seller didn’t own some of the assets that they have sold to the purchaser? What happens if significant changes are made to the business between the time the negotiations started and the purchase is finalised? Finally, as a purchaser, you need to do your homework before signing the agreement. 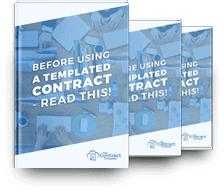 Look into all the contracts the business has, to make sure they are solid and won’t be easily terminated as soon as you buy the business. Look into the intellectual property belonging to the business. Does the business own the trademarks they are using? Did they pay for them? What about copyright and other intellectual property? You are going to have enough things to worry about so why don’t you leave us to worry about the purchase contract. Take your time, do your research, consider your options and good luck! For all of your legal contracts including business sale and purchase contracts, call us at The Contract Company today.